Pomegranates are native to the area of modern Iran and Iraq and have been cultivated there and throughtout the Mediterranean region and southeast Asia for millenia. They have a thick reddish skin that needs to be cut open to reveal hundreds of seeds. The seeds are embedded in a delicious water-laden pulp - the edible "aril." They have a delicious sweet-tart flavor! The pulp and the seeds are edible. 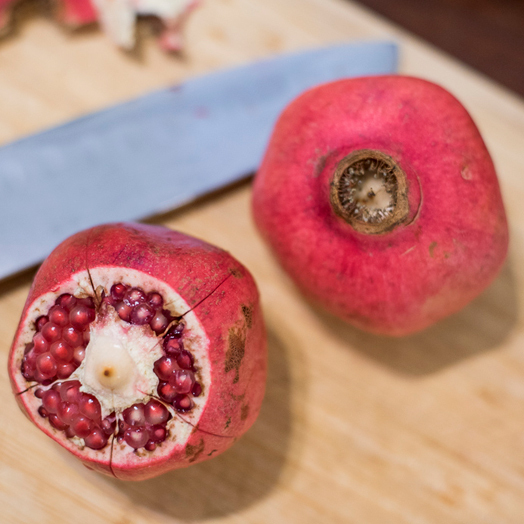 The name pomegranate derives from medieval Latin pōmum "apple" and grānātum "seeded." Pomegranates were first introduced in the United States by Spanish settlers in the 18th Century and are grown in California and Arizona today. Loaded with antioxidants, vitamins, potassium, folic acid, and iron, pomegranates are known for their nutritional benefits. Pomegranate juice is high in vitamin C. The seeds are an excellent source of fiber.